Wait, move back home? Yes, sociologist Katherine Newman tells us. Rather than finding an apartment with friends or buying a home of one’s own, Newman has found that after graduation, more and more 20-somethings are returning to live with their parents. 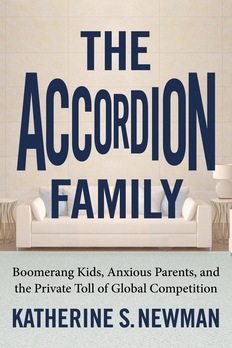 In her book, “The Accordion Family: Boomerang Kids, Anxious Parents, and the Private Toll of Global Competition,” Newman points to the simple economics of it all: a down global economy coupled with increasingly expensive education costs make staying at home a financially attractive decision for an increasing number of young adults. “We now have outsourcing and downsizing and a much bigger temporary labor force than we had before….It was new entrants to the labor market who were really most affected by those changes….And that left this generation, and it will be all succeeding generations unless this changes, without really any other reasonable option, except being in an accordion family,” Newman says. And the staying-on-with-the-parents trend isn’t confined to the United States. Newman found similarities across the globe, though parents had different explanations as to why their adult children were living with them. It’s all about how these kids these days, they’re not behaving properly, they have rejected our way of life, they don’t seem to know how to grow up. And then if you probe a little deeper and say: Well, why did that happen? You get a very mournful account: We failed as parents. The Spanish baby boom generation was…an activist generation during the end of the Franco regime. And so they are an intensely political generation, and their explanations for why things happen do tend to run in a political and left direction. So they will say: My child is still at home because the government…permitted short term employment, part-time wages and within less than a decade a huge chunk of Spanish youth were found in those kinds of jobs….They couldn’t earn enough money to own a home and there’s very little rental housing in countries like Spain. The Italians basically say: ‘Well, I love having my children at home. Why would they ever leave me?’ And in fact, when you get to the south of Italy, which is still a very agrarian country, for them a child leaving is about migrating to find work, because there is no work. So for them, keeping your children at home is a symbol of stability and capacity to hold on to your family. Watching them leave — that’s a terrible shame. More on Tuesday’s NewsHour. But one aberration: Kids in Nordic countries are not boomeranging back. Same economic problems, different outcomes. Given this is a post on Valentine’s Day, you might be surprised to know Newman thinks it might have something to do with a lack of amore. Watch our video above. Now we want to know, what do you think? Did you stay or move back home after graduation? Why? Are you a parent of a boomerang grad? Did you move out and think there’s something else at play Newman missed? Let us know in the comments below, or tell us on Facebook.